Taking regular exercise when pregnant boosts a newborn baby’s brain development, research has shown. Just 20 minutes of moderate exercise three times a week was enough to give infant brains a head start, scientists found. The benefit could have an impact on a child’s entire life, according to researchers attending the Neuroscience 2013 congress in San Diego, US. Study leader Professor Dave Ellemberg, from the University of Montreal in Canada, said: “Our research indicates that exercise during pregnancy enhances the newborn child’s brain development. “While animal studies have shown similar results, this is the first randomised controlled trial in humans to objectively measure the impact of exercise during pregnancy directly on the newborn’s brain. In the past, women would be advised to take it easy and rest during pregnancy. Now it is widely accepted that too much inactivity can be harmful both to mother and child. Co-author Professor Daniel Curnier, a sports and exercise scientist at the University of Montreal, said: “While being sedentary increases the risks of suffering complications during pregnancy, being active can ease post-partum (after delivery) recovery, make pregnancy more comfortable and reduce the risk of obesity in the children. Women taking part in the study were randomly assigned to an exercise or inactive sedentary group. Those in the exercise group had to undergo at least 20 minutes of moderate cardiovascular exercise three times a week. The exercise sessions were intense enough to produce slight shortness of breath. Women in the sedentary group did not exercise at all. 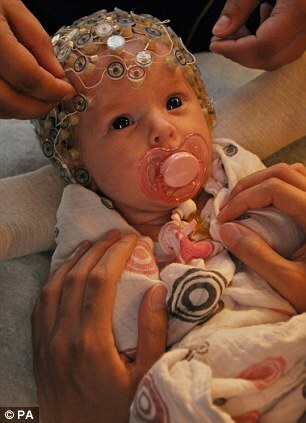 Eight to 12 days after they were born, the women’s babies had the electrical activity of their brains measured. Each baby had a close fitting “bathcap” of electrodes placed on its head. “We used 124 soft electrodes placed on the infant’s head and waited for the child to fall asleep on his or her mother’s lap,” said Elise Labonte-LeMoyne, another member of the University of Montreal team. “We then measured auditory memory by means of the brain’s unconscious response to repeated and novel sounds. The scientists are now assessing the babies’ thinking, physical and language ability at one year old to see if those whose mothers exercised perform better. Newborn babies born to healthy, well nourished mothers are strikingly similar in size the world over, scientists have shown. More must be done to encourage exercise in women over the age of 30, experts have said after new research found that physical inactivity is potentially the greatest risk factor in developing heart disease for these women. Sibling rivalry may extend to breastfeeding infants who keep their mothers up at night to prevent them getting pregnant, an expert has claimed. A “pandemic” of inactivity in poor areas of England is leading to premature deaths, a report has warned. Children who exercise regularly while growing up are more likely to perform better in academic tests when they are older, research suggests. One in 14 women have an eating disorder in the first three months of their pregnancy, according to research.